September 18, 2015 – Imagine a Global Positioning System (GPS) flying through the vacuum of space at 22,000 mph, rapidly spinning 43,000 miles above the surface of the blue planet below. Would it work? As it turns out, the answer is yes. 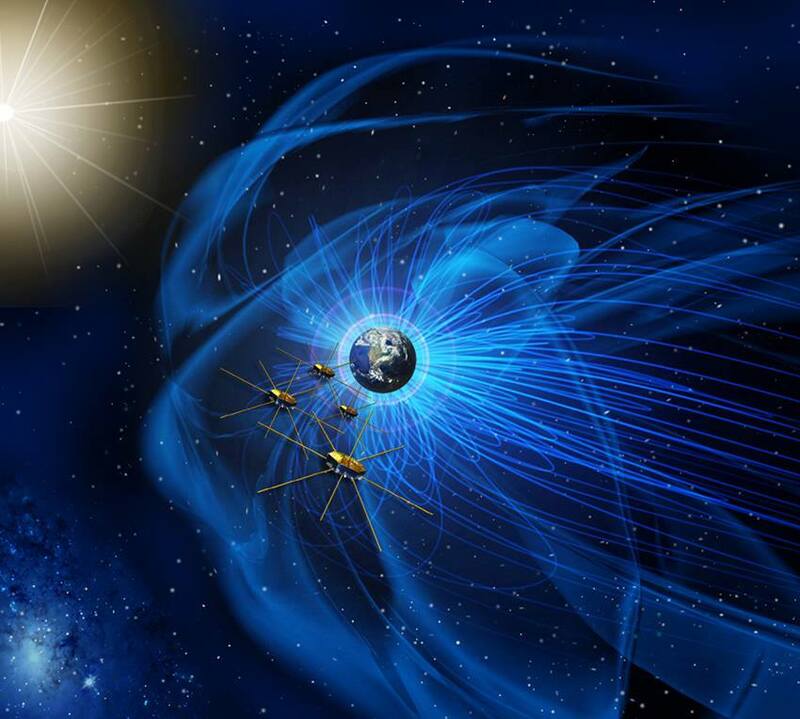 NASA has developed a GPS navigation system for the newly-launched Magnetospheric Multiscale (MMS) satellites that operates under these incredible conditions. The four spacecraft were launched on a United Launch Alliance (ULA) Atlas V rocket on March 12, 2015 on a mission to investigate the physics of magnetic reconnection. Magnetic reconnection occurs when solar particles streaming in from the sun interact with those that surround the Earth. Magnetic lines of force cross, cancel and reconnect and magnetic energy is unleashed, with charged-particles flying off near the speed of light. This process happens in many places and can disrupt the power grid, as well as communications and transportation. Understanding how magnetic reconnection works requires the four spacecraft to fly in a tight pyramid formation through Earth’s magnetic field. Positioning is crucial. Speed and altitude are not the only challenges for the spacecraft’s onboard GPS units. In addition, the MMS spacecraft spin; each one makes three revolutions per minute. During the first month, the team compared the MMS “Navigator system” with orthodox ground tracking systems and found Navigator to be even more accurate than expected. At the farthest point in its orbit, some 43,500 miles away from Earth, Navigator can determine the position of each spacecraft with an uncertainty of better than 50 feet. The MMS Navigator system exceeded all of the team’s expectations. At the farthest point of the MMS orbit of 43,500 miles, Navigator was able to receive signals from the GPS satellites and perform onboard navigation solutions. At the lowest point of the MMS orbit, Navigator traveled at velocities over 22,000 miles per hour. In comparison, GPS satellites orbit at 12,550 miles away from the earth and travel at 8,600 miles per hour, and most satellites using GPS receivers are in low earth orbits at altitudes between 110 and 1,250 miles. This system will be even more important during the second phase of the MMS mission when the orbit will double in size and travel all the way out to 95,000 miles from Earth. Thanks to this extraordinary GPS tracking, the work of understanding magnetic reconnection can begin. The Laboratory for Atmospheric and Space Physics (LASP) in Boulder, Colorado, serves as the MMS Science Operations Center (SOC), leading science operations planning, instrument command sequence development, and science analysis support. Additionally, science data for all MMS measurements is hosted at LASP and then centrally disseminated to the science community.